Pat Frank's Alas, Babylon was first published in hardback in the UK by Constable and Company in 1959, the same year as the American Lippincott first edition. 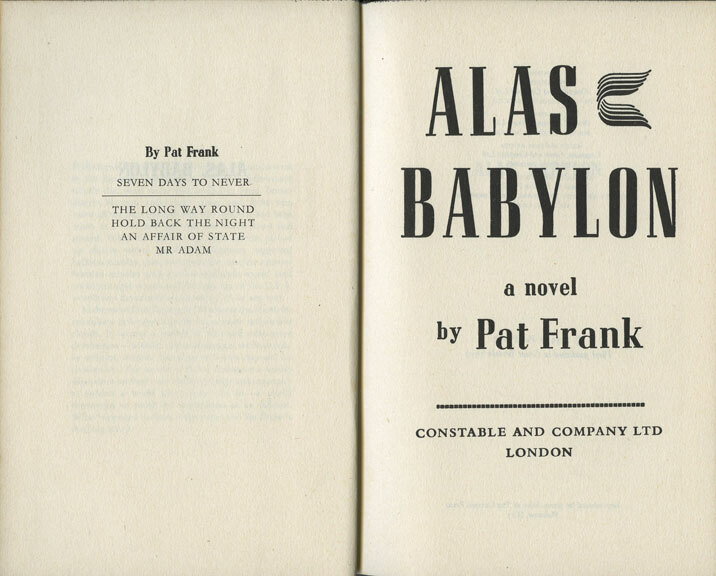 The copy seen here was a very lucky online find; while there are, at present, around sixteen copies of the US first edition listed for sale on AbeBooks, ranging from about forty quid for a jacket-less or ex-library copy to about £600 for a fine first edition, there are only five copies of the UK first, and only one of those from a UK seller (for £50). 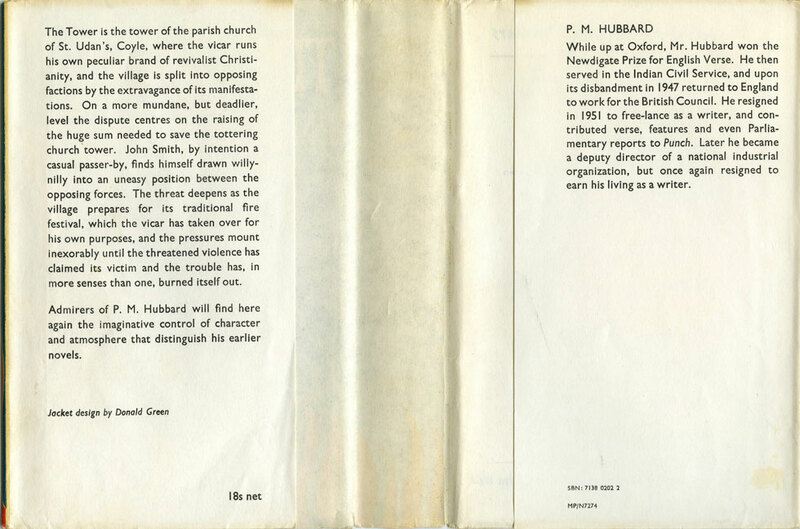 After enquiring after an AbeBooks copy which turned out to be a second printing, I eventually took a punt on an Amazon Marketplace copy for less than a tenner, and turned up trumps with a first edition/first impression in very good nick and with a bright, unclipped dustjacket. 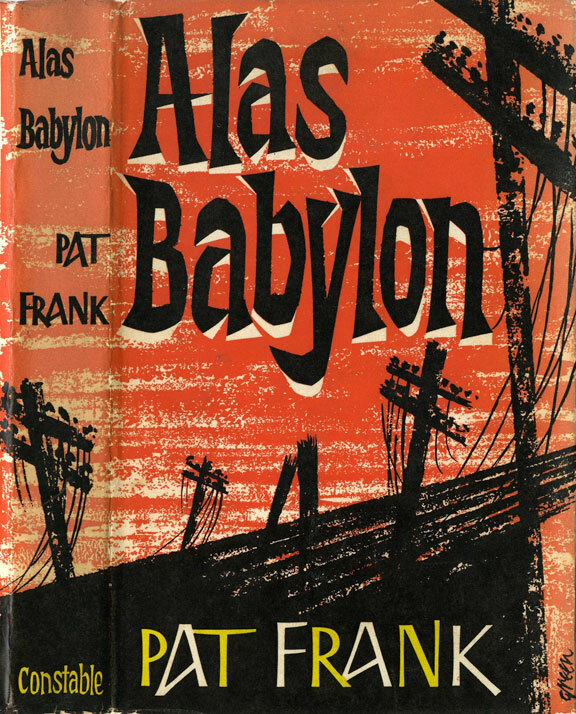 Like the aforementioned On the Beach, which preceded it by a couple of years, Alas, Babylon is one of the earliest attempts at a realistic depiction of a post-nuclear-conflict world. 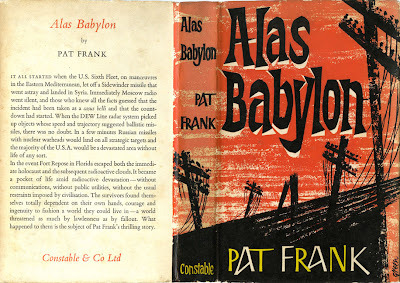 In his foreword to the novel, Pat Frank – real name Harry Hart Frank – explains that he wrote the book in response to a question from an acquaintance: "What do you think would happen if the Russkies hit us when we weren't looking—you know, like Pearl Harbor?" Frank replied, "Oh, I think they'd kill fifty or sixty million Americans—but I think we'd win the war." To which his acquaintance responded, "Wow! Fifty or sixty million dead! What a depression that would make!" Frank determined to write a novel that would make explicit "the exact nature and extent of the depression", and Alas, Babylon was the result. Set largely in the Florida town of Fort Repose, the novel details the gradual disintegration of society following a nuclear exchange with Soviet Russia: radiation sickness, suicide, food shortages and so forth. Frank deals with all this in a matter-of-fact fashion, avoiding sensationalism in favour of a straightforward account of the effects of nuclear war both on Fort Repose – which escapes a direct strike but whose denizens are nevertheless deeply affected – and on the wider world. Despite being published over fifty years ago, Alas, Babylon remains a powerful and influential piece of fiction – David Brin for one has identified it as an influence on his 1985 post-apocalyptic novel The Postman, and wrote a foreword for a 2005 edition of Alas, Babylon. 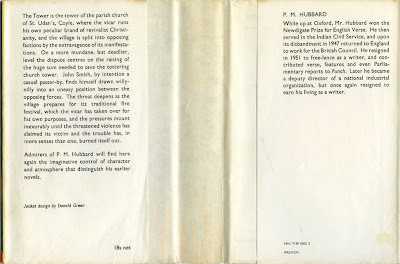 There's no cover credit on the 1959 Constable edition's dustjacket flaps – which, you'll note if you click on the image above, sport an excerpt from a review by none other than then-future spy thriller novelist Anthony Price, who talks about his reviewing career in parts one and two of my interview with him – although there is a signature at bottom right on the front: "Green". But the style of the jacket illustration looked familiar to me, so, as is my wont when confronted with a dustjacket design mystery, I stared at my bookshelves for a while to see if anything rang a bell. 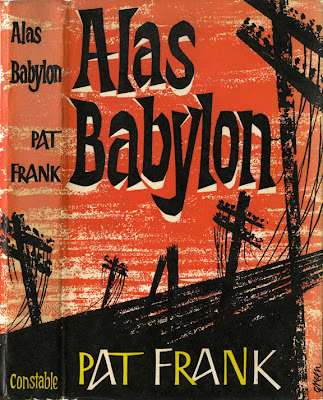 I thought at first it might be the same artist who designed the jackets for the 1951/1954 British first editions of Ray Bradbury's The Silver Locusts and David Grubb's The Night of the Hunter, but that was Roy Sanford. Then I wondered if it might be the artist responsible for the 1962 British first of Francis Clifford's Time is an Ambush, but that was actually Peter Probyn. 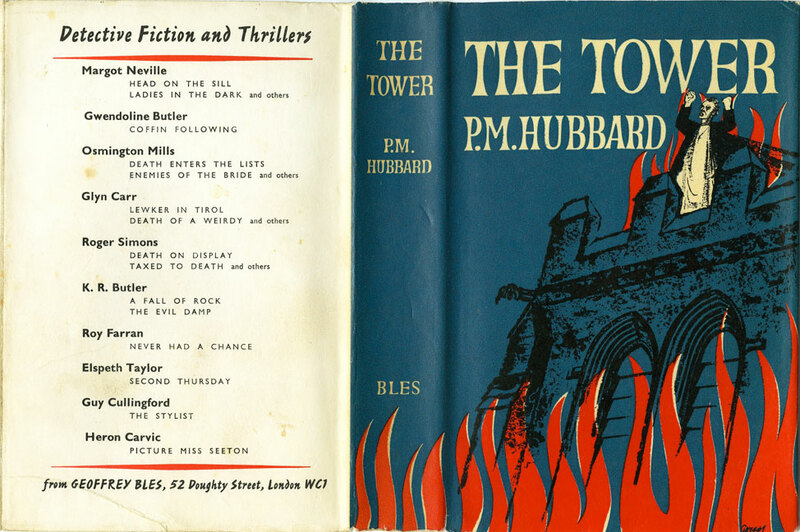 A first edition of The Tower, by British suspense novelist P. M. Hubbard, published by Geoffrey Bles in 1967. 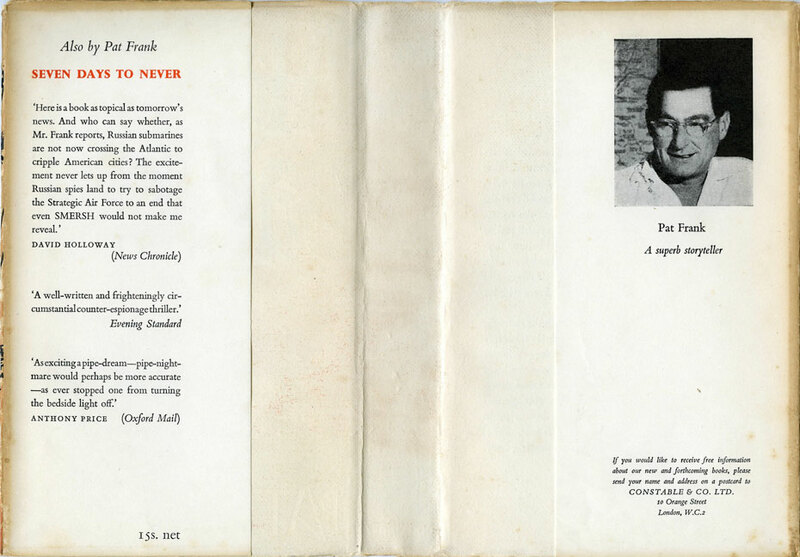 And there, at bottom right on the front cover, was the same signature, identified on the jacket flap as Donald Green. Mystery solved. 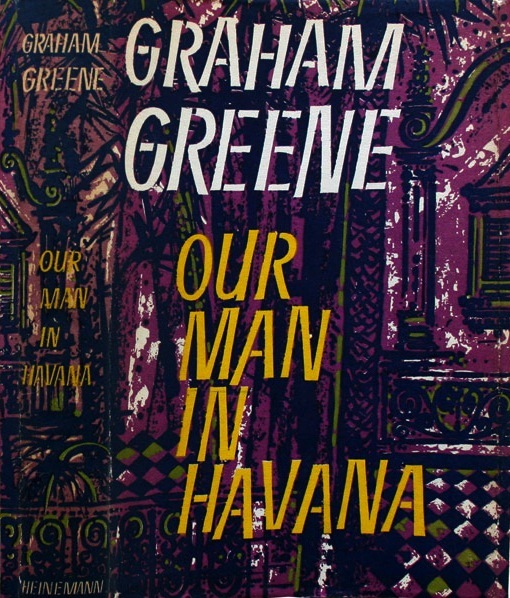 The UK first edition of Graham Greene's Our Man in Havana, published by Heinemann in 1958. Here again, Donald Green deploys what looks to be either a linocut or screenprint technique in a manner which is typical of wrapper design of the period. Indeed, British designers such as Green, Roy Sanford, Peter Probyn – and others like John Rowland and Denis McLoughlin – created, to my mind, some of the most beautiful dustjackets ever wrapped around a book, combining hand-cut typography, a dramatic sense of chiaroscuro and wonderfully vivid yet restricted-palette colour schemes with an abstract or allusive approach to each book's subject matter. 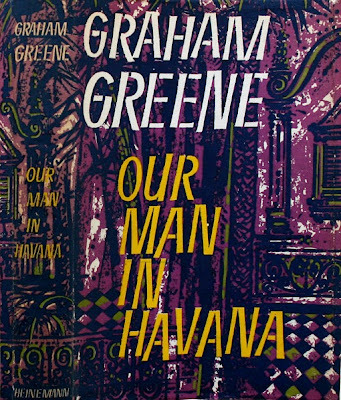 For my money, the 1950s and 1960s were a golden age for British book jacket design, and Donald Green was one of the finest artists of the era. Click here to visit Existential Ennui's Beautiful British Book Jacket Design of the 1950s and 1960s page. I really like your edition of The Tower. 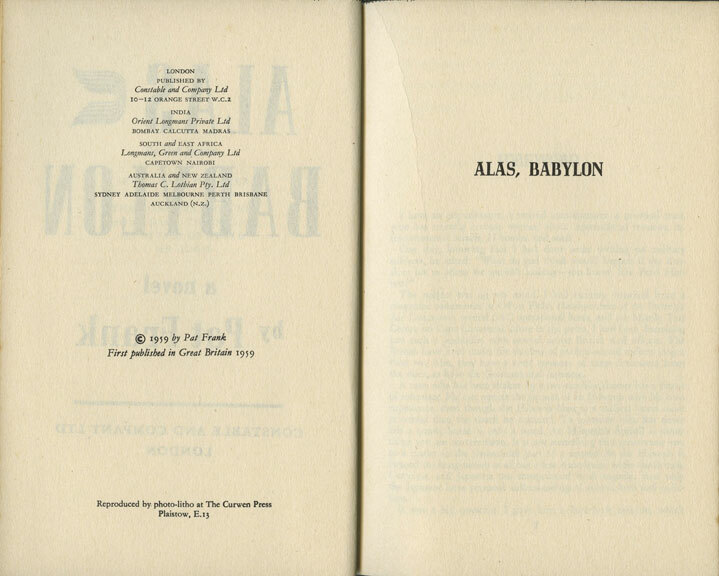 I have an American first edition, published by Atheneum. Just a plain old tower on it. Donald Green's design is wonderful. 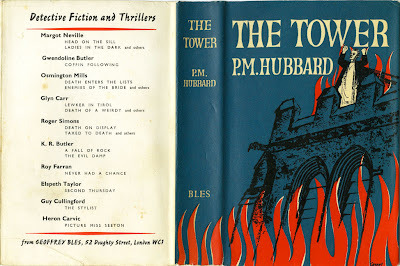 I haven't read The Tower yet either. This current run of post-apocalyptic posts is great. Any thoughts about a Nevil Shute Season in 2012? I'll definitely be returning to Nevil Shute down the line: I've got a couple more of his books to blog about, so watch this space! Er, well, not *this* space: I won't be posting anything on Shute in this comments thread. That would be daft.